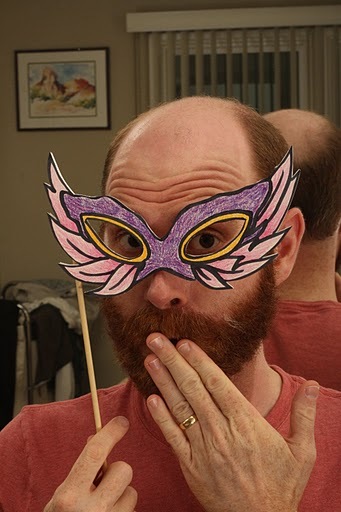 Photo Booth Props/Masks | What's Jenny Making? 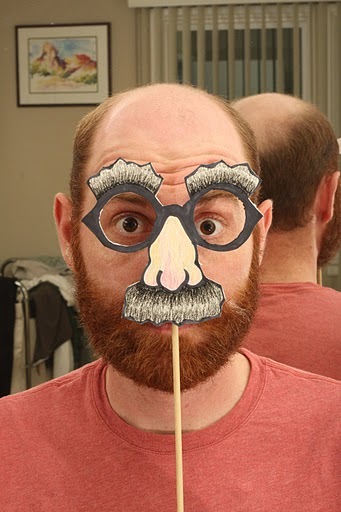 The other day I noticed a post on this blog about DIY Photobooth Props while I was perusing the internet. 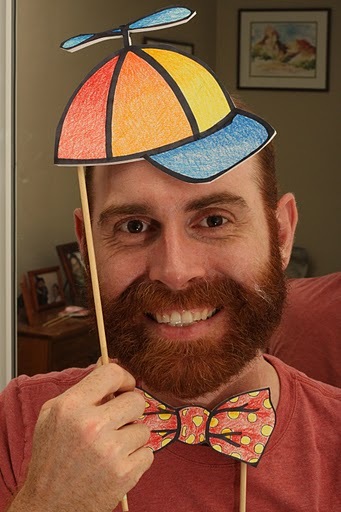 Because my husband Gavin is very into the whole photobooth idea and loves taking pictures of people with props, I sent him the link. 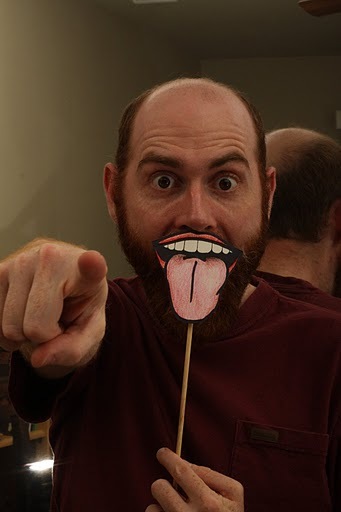 He, of course, was enthused and thought it’d be a great idea to make the props for the family reunion we’re going to on his side of the family, 4th of July weekend, up in Chester, CA. When it got down to the time to start making the masks, he wanted me to help him make some, but didn’t want to use the downloadable PDF that the blog offered for the masks that they used. 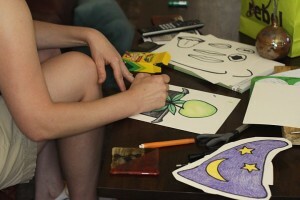 I was initially a little anxious about this and asked him to find me samples of things he wanted to be made into masks. 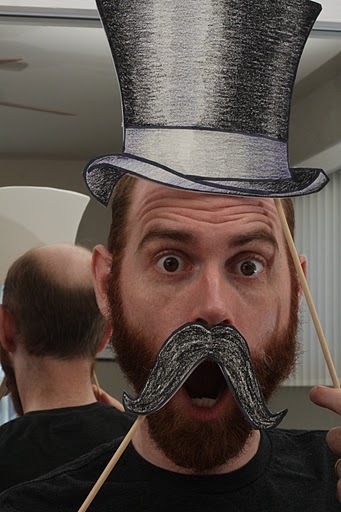 Gavin took this to heart and sent me ideas galore: mustaches, top hat, party hat, groucho glasses, t-rex claws and fangs, bling necklace, bow-tie, monocle, neck ruffle and so forth. So, I grabbed some 8.5×11″ cardstock and began drawing. 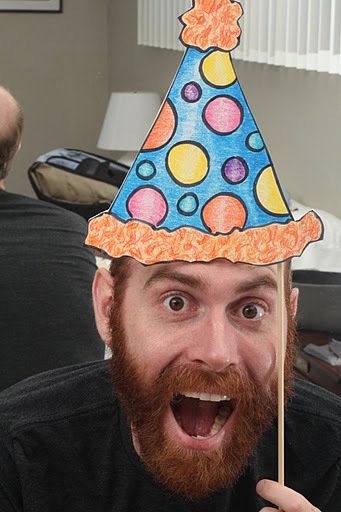 I didn’t measure out anything, so it is a little remarkable that I got the sizing for the hats and the glasses and stuff fairly dead-on. Some of the stuff isn’t exactly right, but I suppose it’s close enough. After I drew the basic shape, I outlined in thick, black marker, both for definition and also for a little bit of grace when cutting out. 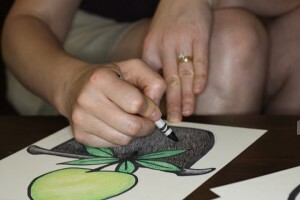 I then colored in the drawing with crayons, my first time using crayons in a number of years. It was surprisingly fun to break out a box of new crayons and go to town — it reminded me of the absolute pleasure of doing that when I was a kid. 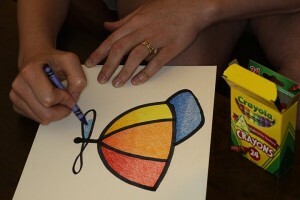 And, as my friend Jenn points out, the crayons as medium reinforces the whimsy of the whole project. 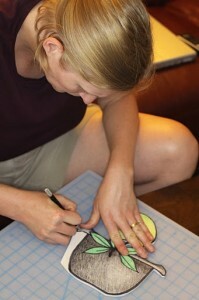 After coloring, I spray-glued the drawings onto foam core board and cut them out. Gavin then took them and attached the sticks to them. I’m really very pleased with how they came out — the coloring looks great and they are pretty fun to play with. Some of my favorites are below…you can see more pictures if you go here or here. 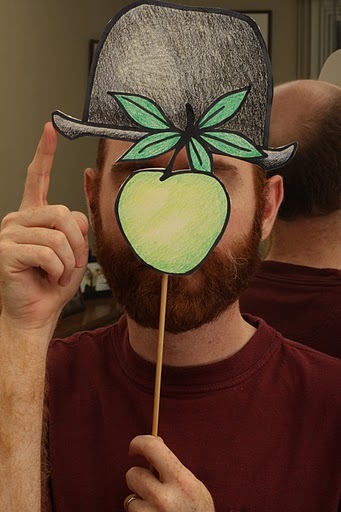 This entry was posted in apple, art, colorful, craft, crayons, masks, photobooth, props, reunion. Bookmark the permalink.